Our February boxes should be with all our UK subscribers by now and our international subscribers should be receiving them very soon. We hope you enjoy what we have selected for you this month. We have three teas from China; Jade Oolong, Lu An Gua Pian and Yunnan Golden Tip. The last tea is a lovely light Darjeeling from Castleton Estate. Whether you are already tasting our tea selection or still looking forward to it, here is the little handy guide with all details for Curious Tea‘s February boxes. This beautiful Formosa Jade Oolong is the first oolong tea to feature in Curious Tea subscriptions. Oolong tea is the result of unique processing which makes it very different to other teas. Oolong tea undergoes partial oxidation ranging from 10% to 90% and this wide range creates a very large variety of oolong teas. 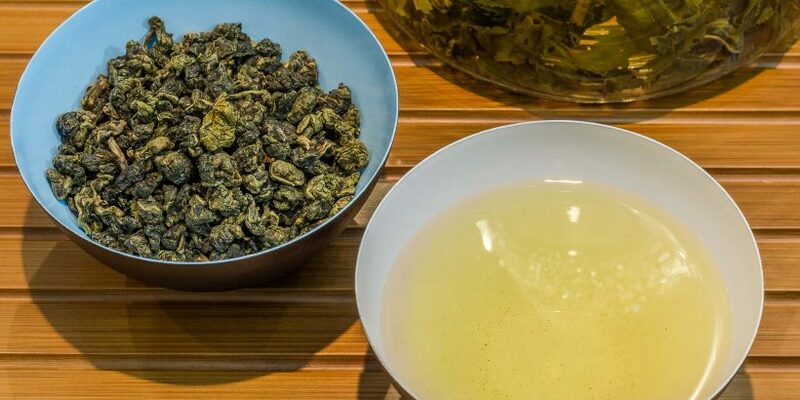 Oolong teas that undergo lighter degree of oxidation are generally much closer to green teas in colour and flavour while oolong teas with higher degrees of oxidation resemble black teas. Oolong tea is also sometimes known as ‘blue’ or ‘blue-green’ tea due to the colour of dry leaves of some varieties. The wide variety of oolong teas along with complex flavour profiles make oolong teas a strong favourite amongst tea and food connoisseurs. 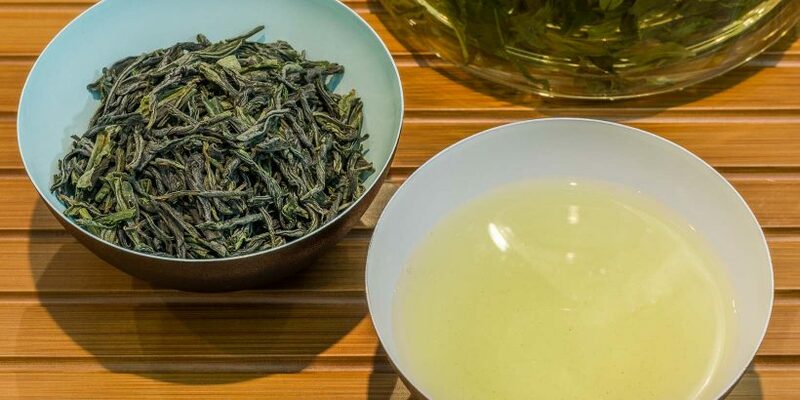 This particular Formosa Jade Oolong, which is in our February Light and Mixed boxes, underwent only slight oxidation resulting in a tea that produces a very light but complex infusion. This partially oxidised oolong comes from Nantou County, the only landlocked county of Taiwan and is picked during the first plucking of fresh spring leaves. The dry leaves are tightly rolled during processing and are very green in colour with a slight blueish tint, hence the name ‘blue’ tea. When brewed the resulting liquor is a very bight light colour. The flavour of this tea is extremely smooth with a complex floral and fruity aroma. This oolong tea is best brewed at 85°C for 2-3 minutes using glass teaware to see the unfurling leaves. Following infusions can take longer steeping times but make sure to brew for at least 4 to 5 times to experience all subtleties of flavour each infusion brings. Oolong tea in general is said to have plenty of health benefits and many people choose to drink oolong tea specifically for those reasons. We do not want to make any specific health claims, but there is plenty of readily available information on health benefits of oolong tea. Most importantly, enjoy this beautiful tea for its complex and intriguing flavours! Lu An Gua Pian (Lu’an Melon Seed) originates in Anhui Province of China. 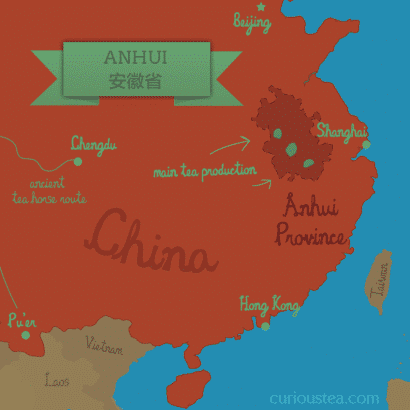 This tea is considered to be one of the best varieties from the Anhui Province, which itself is one of the best tea growing regions of China. 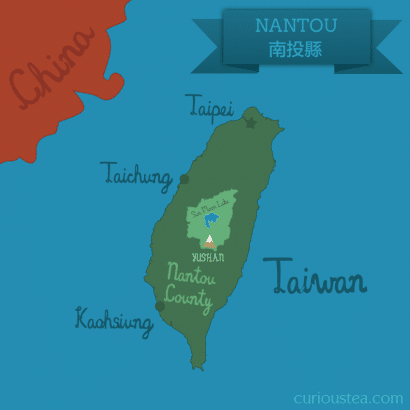 It is one of the famous Chinese Green Teas and is featured extensively in Chinese tea history. The name comes from the fact that the processed tea leaves resemble a melon seed when brewed and fully flat and open. In this sense it is also unusual among Chinese teas as only the leaf is used in processing (without bud). This results in a very laborious hand processing technique making this tea very special indeed. We selected this light and refreshing green tea for our February Light boxes. This tea has large and very neat green leaves with an emerald tint in appearance. Once brewed, it produces a bright liquor with a smooth, light, refreshing vegetal taste and a sweet aftertaste. By vegetal, we of course mean fresh spring greens rather than overcooked cabbage! If you brew this tea somewhat stronger, it has a strong resemblance to lightly oxidised oolong teas from China and Taiwan but is still lighter in flavour. This is another tea that you should try drinking cold. Brew to your liking, decant to a glass bottle and store in the fridge until ready to drink! You can stock up on Lu An Gua Pian in the tea shop. This is a very special First Flush Darjeeling 2014 from Castleton Estate in Darjeeling district. It is located next to the town of Kurseong, which translates as the “Land of the White Orchids”. The estate is very well known for its muscatel teas while also producing very fine first and second flush teas. Most of the tea plants here are from China and the employs orthodox tea processing methods where the leaves are hand plucked and then carefully processed using mechanised equipment to ensure uniformity of leaves. We selected this Darjeeling Castleton Estate First Flush, plucked in 2014, for our February Dark boxes. The appearance of this tea is that of small neat leaves with plenty of black and green colour. Once brewed, this tea produces a bright light liquor with a strong chalky muscatel flavour and a hint of spice. The speciality of this tea estate is muscatel tea and this impacts the flavours that are found in their first and second flush teas, such as this particular one. It is really great to find muscatel flavours in a first flush Darjeeling and this tea does not disappoint. Muscatel flavours are present but without being overbearing. This coupled with low astringency and dry chalkiness of this tea means that this tea can really be described as having a champagne-like character! This tea is best brewed with freshly boiled water for 3-5 minutes. This tea is great paired with food, such as seafood and fish, very much like champagne. This champagne character of this tea makes it the favourite of February for us here at Curious Tea! Yunnan Golden Tip, as the name suggests, is a black tea with plenty of gold tip grown in the Yunnan Province of Southern China. This province borders Vietnam, Laos, Burma and the Assam Valley of India, which results in some teas grown here to be slightly similar to teas from Assam. 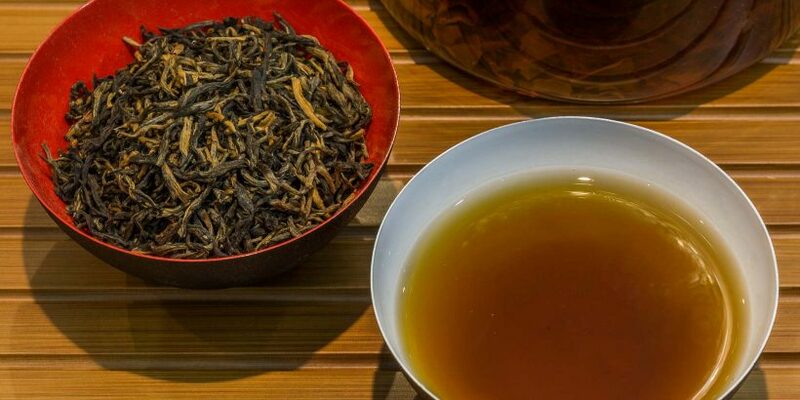 Yunnan Golden Tip is a top grade version of a Dianhong tea as it has a large amount of buds or golden tips present. 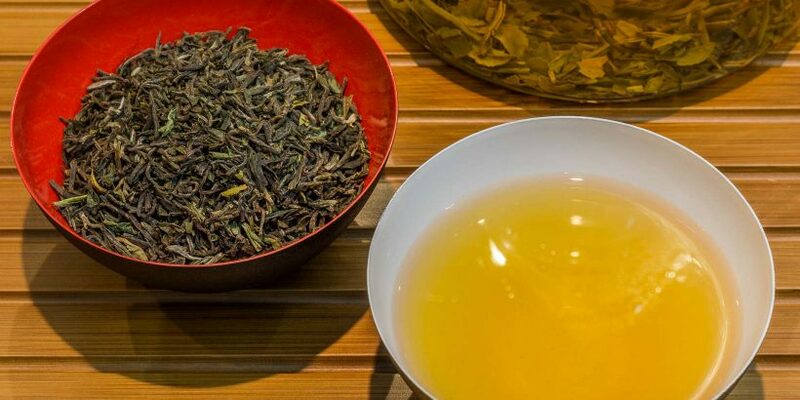 Cheaper varieties of Dianhong tea are often used in blends, while top grade versions, such as this Golden Tip variety should normally be enjoyed on its own. 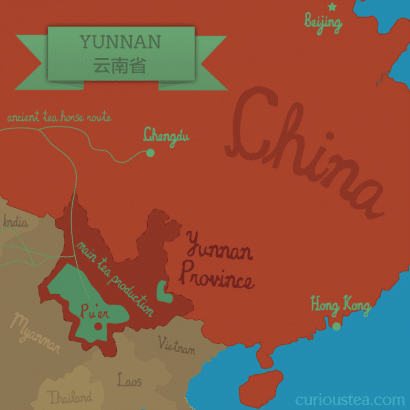 We selected Yunnan Golden Tip for our February Dark and Mixed boxes. This premium tea has a very attractive large and twisted black leaf and plenty of golden tip. Once brewed, it produces a deep brown liquor with a strong malty flavour and caramel aftertaste. Not dissimilar to an Assam in many ways, it still has distinctive characteristics that are not common in other Assam teas. Brew this tea with freshly boiled water for 3-5 minutes. This is a complex tea that can be enjoyed in multiple infusions. If you are finding the flavour too strong, try to reduce the brewing time. We really hope that you enjoyed the tea selection for February and are looking forward to what we have in store for your March selection. Incidentally, if you are reading this but do not receive our monthly boxes and would like to, you can sign up to a tea subscription in just a few clicks. We ship worldwide from the UK. We have also launched an Instagram account, please follow us for pretty tea photos. We will also feature one or two tea previews of what is coming every month, so if you are keen to find out what is coming up in the next box this is the place to look!